At this time of year, many municipalities hold large garbage days. This is where you put your big stuff on the curb and then the whole town cruises the streets, scanning the curbside for treasures. In today’s age of marketing, they now call them “free giveaway day”. My favourite large garbage day story happened in Oakville about 20 years ago. Dave and I were either dating or just married, and we had an old beat up Ford Ranger truck and an empty apartment to furnish. Nobody does large garbage day like Oakville. As my brother’s buddy Jim Reid says, the official uniform of the Oakville housewife is a Lululemon track suit, so you can count on their castoffs being sweet. We’re cruising around in our truck and we pull up to a house with a perfectly fine hockey net at the end of the driveway. Just as we pull up, a BMW parks behind us and out comes a young family dressed to the nines who look like they have just come from church or a family brunch. A young boy raced to the hockey net and started pleading with this father to have it. His Dad was explaining to the boy that there was no way he could fit it in his car when Dave and I stepped in and offered to drive the hockey net in our truck to their home. We followed them home to one of the ritziest neighbourhoods in Oakville. Seriously. These were million dollar homes. We dropped the net off, the family thanked us and we went on our merry way to find our next score. The morale of this story? It doesn’t matter how rich you are, how much stuff you have, there is always something you want and when you can score it for free, it’s a happy day. This week’s #HappyAct is to find out when large garbage day is in your community and cruise the streets for free stuff. You never know what you will find or who you will meet. Here’s our contribution—not curbside, but in our barn for anyone who wants it. 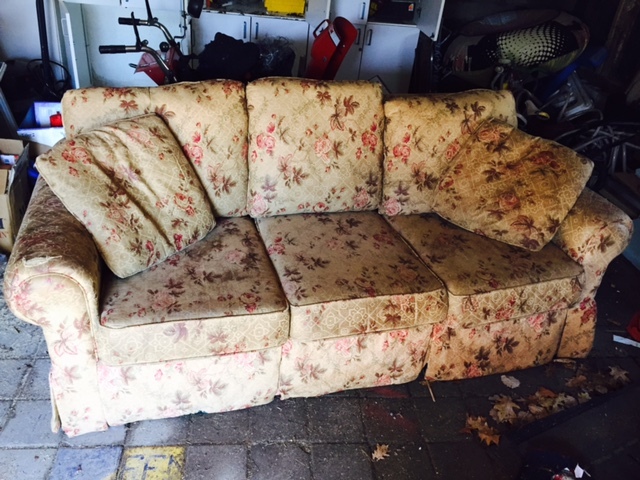 Our old couch—perfect for a cottage or hunting camp, and free to a good home. Here’s the ad on Kijiji if you’re interested. If we like you, we may even deliver it for ya!